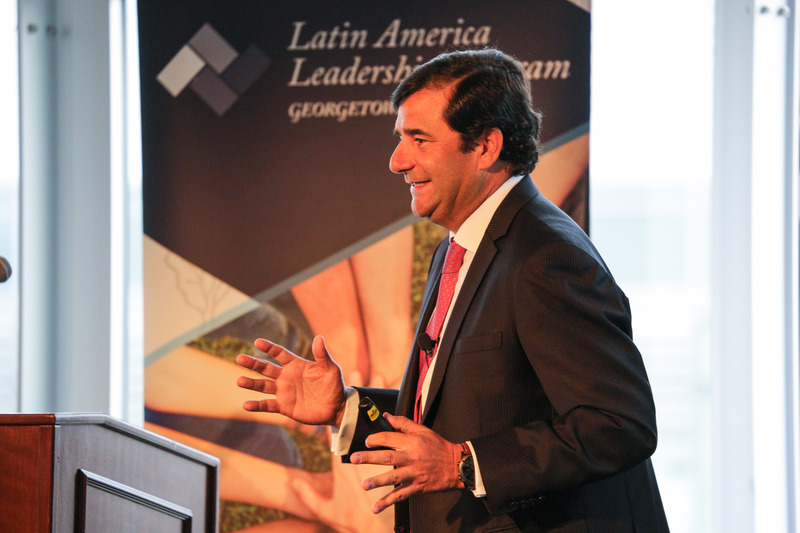 Georgetown University’s Latin America America Leadership Program (LALP), the McDonough School of Business Global Business Initiative (GBI), and the Center for Latin American Studies (CLAS) were pleased to present MSB Dean Paul Almeida in conversation with Mr. Cesar Cernuda, president of Microsoft Latin America, and MSB Professor Ricardo Ernst, executive director of LALP and GBI. 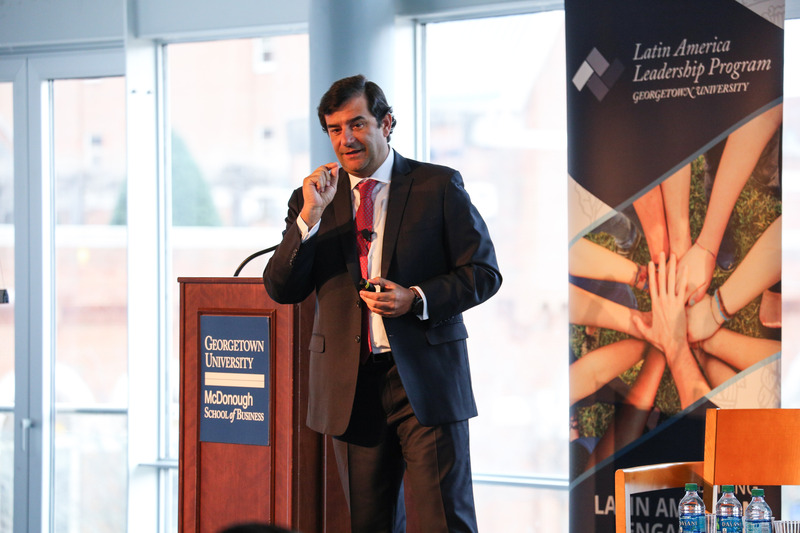 Georgetown University’s McDonough School of Business (MSB) Dean Paul Almeida and Executive Director of the Latin Ameica Leadership Program and MSB Professor Ricardo Ernst joined Cesar Cernuda, president of Microsoft Latin America and corporate vice president of Microsoft Corporation, as he discussed digital transformation in Latin America during an event hosted by Georgetown University’s Latin America Leadership Program (LALP),Global Business Initiative (GBI), and Center for Latin American Studies (CLAS). 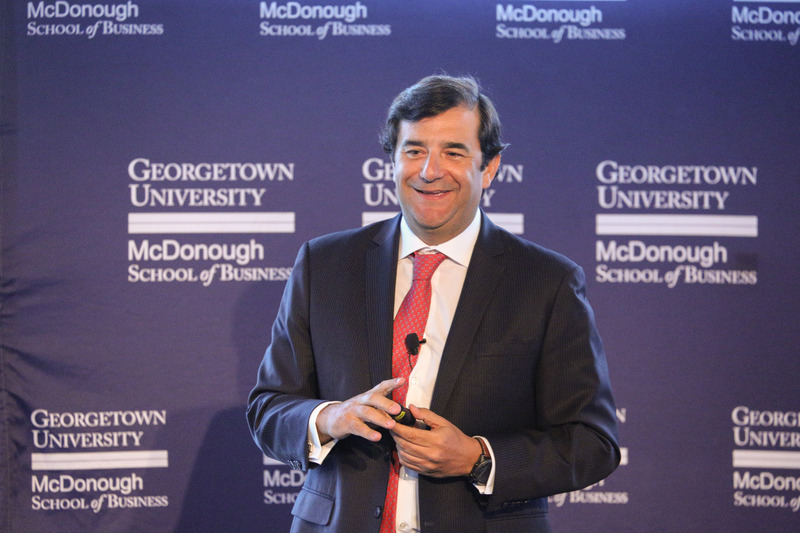 Mr. Cesar Cernuda's talk on innovation and digital transformation was very inspiring to us coming from developing countries, where we are still paying little attention to such an important matter …. Embracing and accelerating digital transformation in our region will help us close the gap with developed countries at a faster pace. 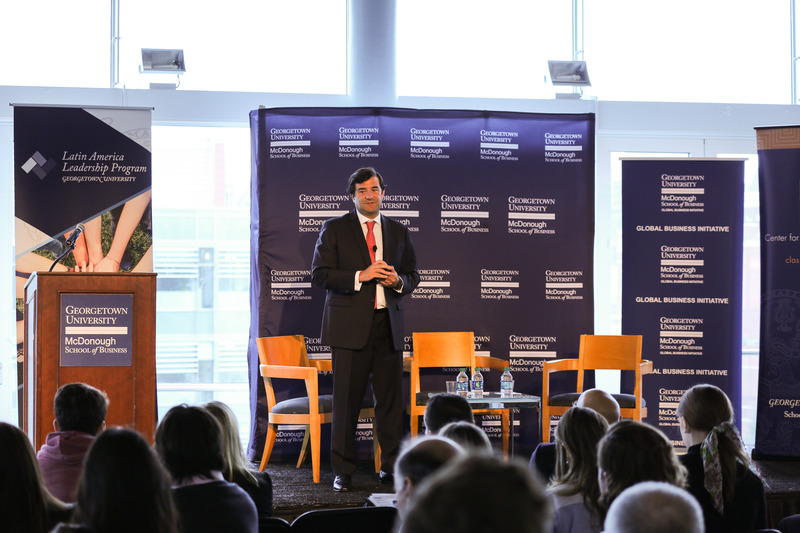 Cesar Cernuda is president of Microsoft Latin America and corporate vice president of Microsoft Corporation. He oversees a business that includes 35 offices in 21 countries, with more than 2,000 team members and 80,000 business partners and his main priority is to accelerate the company’s current transformation as a leader in cloud computing and artificial intelligence, to support the company mission to empower every person and every organization on the planet to achieve more. Previously, Cernuda was president of Microsoft Asia Pacific, and has spent more than 20 years at Microsoft. Cernuda has a bachelor's degree in business administration and marketing from the University ESIC in Spain, and completed a program for executive development (PDD) at the IESE Business School of the University of Navarra in Spain. Cernuda has been recognized as one of the “Top 50 Most Influential Hispanics” by the Hispanic IT Executive Council; as one of the "100 most influential Spaniards in the world" with the ‘100 Españoles’ award, the “Best Executive of the Year” in 2011 by Emprendedores Magazine, and most recently recipient of the Aster Award to celebrate his remarkable career in the business world by ESIC Business & Marketing School.